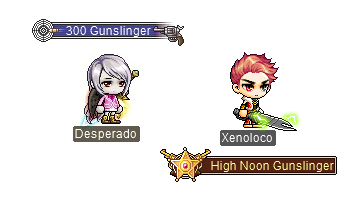 High Noon Gunslinger Event | MapleStory | Dexless, Maplestory Guides and More! It's high noon which means it's time for a new mini-game! In the High Noon Gunslinger event, you can join 3 other players for a Western-style shootout. Players Lv. 33 and above can begin by accepting the quest ‘[Event] Game Master's Invitation’ to start the tutorial. After learning the basics, you’re ready to become the best gunslinger! Click on the pistol icon and select the quest '[Event] Become the Gunslinger' to be moved to the High Noon Gunslinger lobby map. Speak with Game Master Jun to queue up for a game. Once 4 players have queued up, the game will begin. 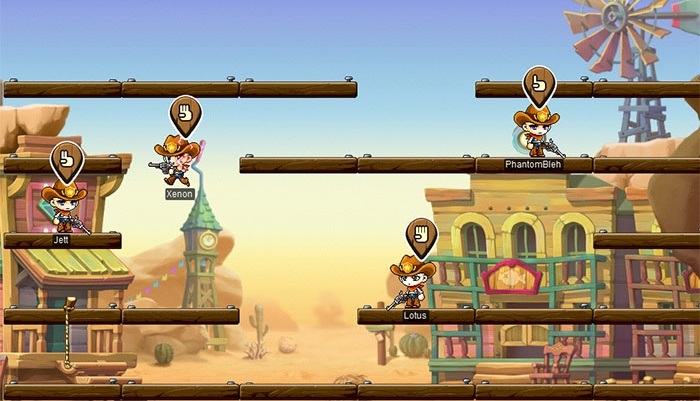 In the event map, each player becomes a gunslinger located on a platform. During the round, you can make one move to a nearby platform. You also select one platform to shoot at and destroy. You have 10 seconds to make your selections. Once all players have made their selections, the shots are fired in order of player input. If your platform is destroyed, you will fall to the platform below, or if no platform exists, fall to your doom. The goal is to be the last player standing at the end of all the rounds! Earn points based on your skill, and collect special rewards. You can enter the mini-game 20 times per day UTC. Just by participating you can get a new title and medal! Participate 5 times: High Noon Marksman: Title. Untradeable. Title will display the amount of hit points you have. STR/DEX/INT/LUK +3, Weapon ATT/Magic ATT +3, Max HP/Max MP +500. Participate 70 times: High Noon Gunslinger: Medal. Untradeable. Req. Lv: 33. STR/DEX/INT/LUK +15, Weapon ATT/Magic ATT +10, MaxHP/MaxMP +1000, Speed +15. The medal is permanent, but the stats will expire after 30 days. 25,000 Points - Quickdraw Chair: Untradeable. Can purchase 1 per world. 20,000 Points - High Noon Damage Skin: Moveable within the account, 7-day duration. Can purchase 1 per world. 20,000 Points - Storm Growth Potion: Moveable within the account, 7-day duration. Can purchase 1 per world. 20,000 Points - Trait Boost Potion: Untradeable, 7-day duration. Can purchase 1 per world. 18,000 Points - Selective 8 slot (excluding Storage Room): Untradeable, 7-day duration. Can purchase 1 per world. 8,000 Points - Epic Potential Scroll 50%: Untradeable, 7-day duration. Can purchase 1 per day. 6,000 Points - Nodestone: Moveable within account. Can purchase 3 per day. 4,000 Points - 2x EXP Coupon: Gives 2x EXP for 15 minutes. Untradeable, 7-day duration. Can purchase 2 per day. 10 Points - Spell Trace: Moveable within account. Can purchase 500 per day.